Ana Lisa Hedstrom is a California artist and scholar, recognized for her studio work and for her deep understanding of arashi shibori, a Japanese textile technique of resist patterning on cloth, which she has explored for decades. 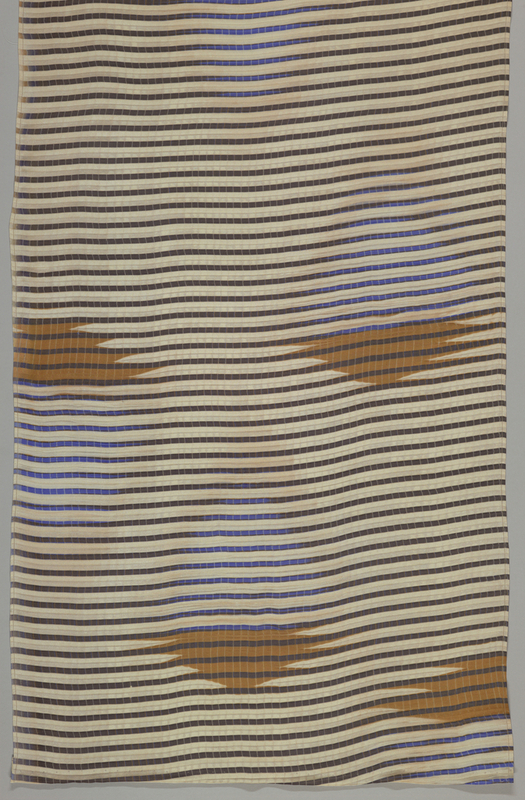 Taking in Ana Lisa Hedstrom’s “Serrate Stripe,” dyed plain weave crepe cloth with narrow brown horizontal stripes and widely spaced geometric motifs, is like riding on a ferryboat, with unex-pected forms floating on a watery surface. Because of their shape, created through color change, these forms suggest ritual flames contained in a censer or incense burner. The sheen of silk and the glow of iridescent color appears and disappears, spontaneous and under control at the same time. How was this parallel, striped patterning achieved? The flattened fabric length speaks of folds and pleats—of pressure, stitching, wrapping. Horizontal stripes crossed by thread-thin vertical lines are activated by not being precise and ruler straight. The mysterious forms which float by defy decoding and any easy understanding of technique. This is cloth that takes a viewer to a world of the imagination, a place of magic, with color that sings. It’s poetry without words, cloth to remember, cloth with memory—resist-dyed stripes holding a luminescent bluish-purple flame, quietly glowing above sawtooth brown container forms. Ana Lisa Hedstrom created this fabric in 1989. It was acquired for the museum by curator Milton Sonday, to be included in the 1990 exhibition, “Color, Light & Surface: Contemporary Fabrics”. Pat Hickman is a studio artist in the Lower Hudson Valley, Emeritus Professor of Art & head of the Fiber program at the University of Hawaii, and past president of the Textile Society of America. Gail Hovey is a writer who rides ferry boats and looks at textiles with Pat Hickman.